David Shrader studied music at the University of Iowa (B.S., M.S.) and the University of Oregon (D.M.A.). 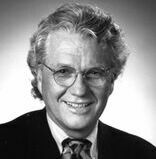 He served as dean of the College of Music at the University of North Texas from 1992-1999. Prior to this appointment, he served as dean of the College of Fine Arts at the University of Nebraska at Omaha as well as other administrative posts in Illinois, and at the University of Washington. In addition to his administrative assignments, Dr. Shrader has continued his involvement as a percussionist, regularly performing chamber music, jazz, and with symphony orchestras. Beyond his academic involvement, Dr. Shrader has initiated two companies in the field of individualized instruction in the arts. He holds several patents in this area.